Do you own or market an ecommerce business? If so, I assume you want to grow. You want to expand. Well, if you ask a couple hundred successful ecommerce business-owners, they’ll say that the top three traffic sources driving ecommerce growth are organic (22%), email (20%) and advertising (19%). In this article, I’ll focus on the second of those: ecommerce email marketing. If you want to drive success with your ecommerce business, it’s not something that can be put to the side. Once you have a website, and before you have a single ad, you need to figure out how you’re building your email list, and what you’re doing with those prospective customers once they subscribe. Because, what’s the point in driving traffic with organic or CPC ads if you don’t have a secure safety net if those people don’t buy? That’s where email comes in. This article will dive into the 7-most essential ecommerce marketing emails you need to have in your repertoire. Welcome emails are credited with driving 320% more revenue than other promotional emails. And yet only 58% of businesses send them. So 42% of you are missing a serious beat here. The Thank You: Be sure that the first thing your new subscribers see is a thank you note from you. Showing appreciation is a great way to start a relationship. What This Means: Make it clear what subscription entails. Break down the frequency of your mailouts and what they’ll contain. Whitelist: You don’t want to risk the chance that your emails get sent to spam, so prompt recipients to whitelist your “from” email address. Discount code: Start the conversation with your subscribers off right by giving them immediate and concrete value. And, of course, prompt a purchase. Our friends over at Easy-SMTP have created an awesome infographic on welcome email optimization. Check it out by clicking on this text. 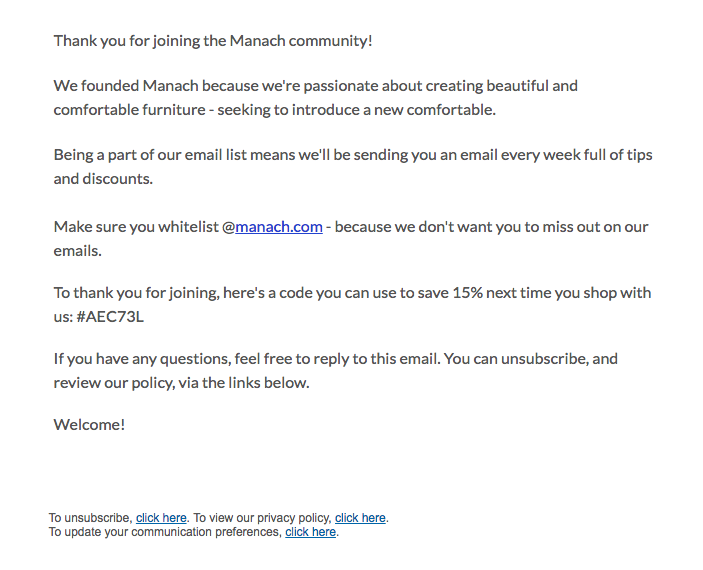 If your ecommerce business is running a sale, your email subscribers need to know. After all, the whole reason they’ve subscribed is to receive updates about when you’re running promotions. 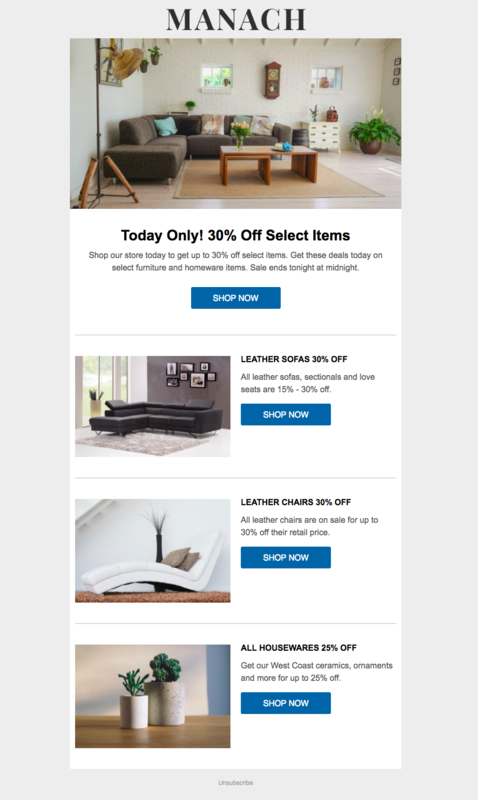 Here’s an email I’ve created for that same furniture company’s upcoming 30%-off sale. 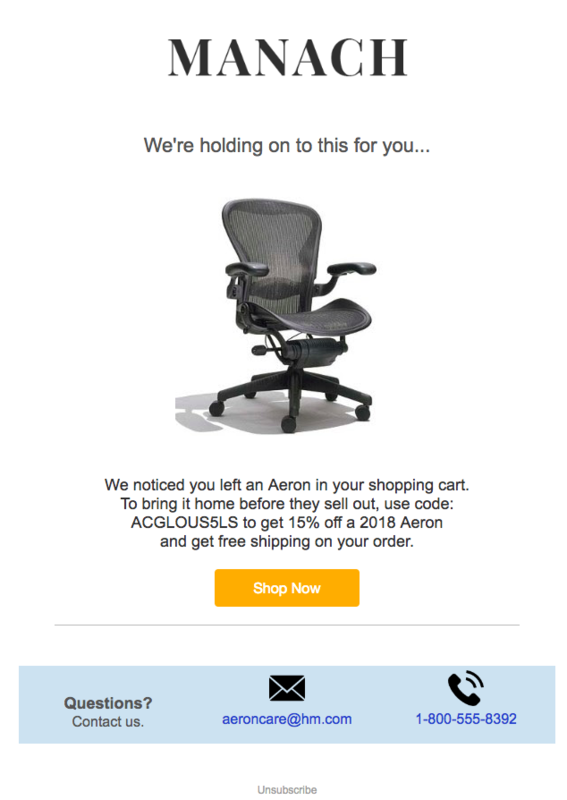 Image-focused: The value of this email isn’t just the 30% discount, but also in showcasing how desirable the things are which are 30% off. Using high-quality images shows your recipients that they’re getting 30% off on something they want. 30% off something you don’t want in the first place delivers 0% value. Multiple Call-to-Actions: Make it easy for your recipients to navigate to the department they’re interested in by having a single primary CTA (leading to your homepage) and then multiple secondary CTAs which enable them to quickly go to what they want. The Value, Front and Center: Whatever your promotion is – whether 10%-off, buy-one-get-one-free, or free shipping – that promotion needs to be in the subject line and headline of your email. It’s the reason people are clicking, so don’t hide it. Online contests are one of the best ways for your business to generate awareness and drive sales. Even though contests are awesome to generate more prospective customers, you should use your existing list to get the ball rolling. The way you do this is to incentivize your entrants to share with their networks: give them bonus entries when they share. 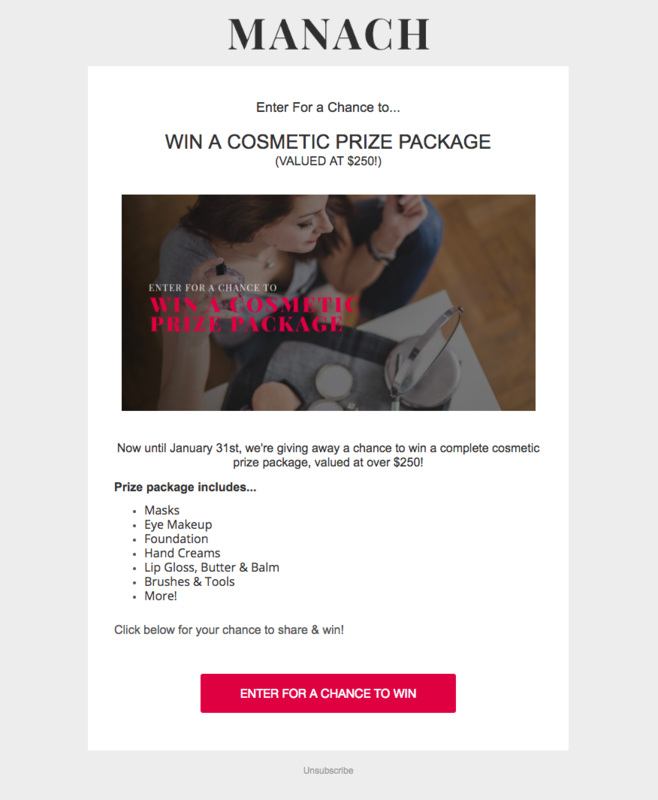 Subject Line: Enter today for a chance to win a $250 cosmetic prize package! Limited Time: Incentivize recipients to enter and share by making your contest open for only a couple weeks. People can be interested, but they’re also lazy. Give them a good reason to act now, rather than next week. Consistent Imagery: This email will send people to a specific contest page. Be sure you use the same (or very similar) image and language to keep your campaign consistent. It’ll improve conversion rates. A Package Deal: If your business sells lower-value products, consider a prize package rather than a single product. The whole is more than the sum of its parts. If you can find a way to incorporate gamification into your ecommerce email marketing, you’ll see some of the most impressive returns imaginable – though it is a challenge to do. 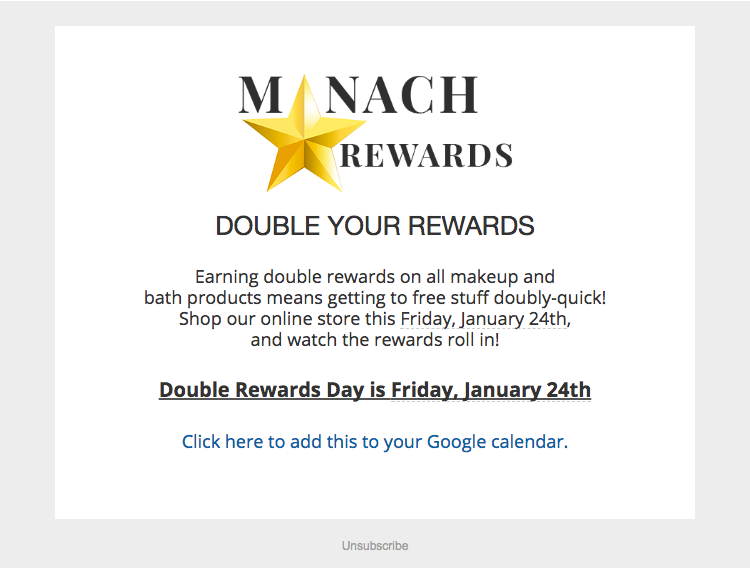 Subject Line: On Friday, January 24th – Double Your Rewards! Gamification, in general, is a super powerful way to drive sales and, more importantly, retention. It’s a way to build community, as well, with people seeing genuine value from their brand loyalty. It is, of course, extremely complicated, as you need to be rewarding people individually for every action they take. But if you can get it to work – whether through a third-party automation platform or your own in-house software development – it can be a huge factor in your business’ growth. 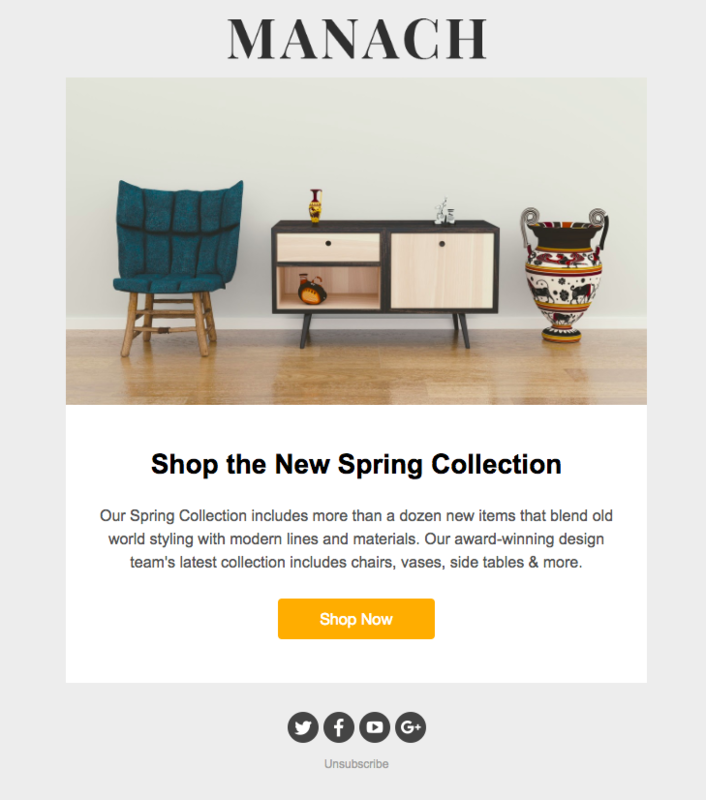 This is the simplest of all the essential ecommerce marketing emails, as it goes out to everybody (no segmentation) and has the simplest “ask” – check out what’s new. Image-focused: Your new product is, by definition, new and exciting. You want to feature that newness (especially with previous buyers) in a visual way. Just as with a software company, where we’re always sure to showcase our newly-updated platform, an ecommerce business needs to show off its shiny new wheels. Short and to the point: Don’t go on in your new product email. Keep your messaging to the point and let the image, and the corresponding product page on your website, speak for themselves. Add a high-contrast call-to-action: Make it obvious where your recipients should click with a large, high-contrast button. This will improve click-throughs on non-personalized emails. About 3 out of every 4 products put in an ecommerce shopping cart is abandoned – which can be one of the most frustrating things in online sales. **You put so much effort into getting someone to your website; optimized the product page; even gotten your visitors to say “yes, I do want to buy this. I’ll put it in my cart,” only to have them end up leaving. 61% of shopping carts are abandoned because of unforeseen costs which weren’t in the initial quote. So, those are the things to avoid. But how do you get back the (let’s say, at least) 50% of people who abandon their shopping cart on your site? The answer is a shopping-cart abandonment email. Subject Line: Hey, You Left Something Behind! All of the other examples in this article are examples I made within Wishpond’s email marketing platform.